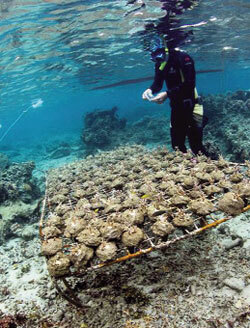 FOR LONG scientists have warned about rapid destruction of corals. Rising ocean temperatures and marine pollution have been identified as the possible causes. Now scientists at Georgia Institute of Technology in the US have found another culprit—seaweeds. The team collected corals from the Fiji reefs and placed eight species of seaweeds close to them to find the mechanism of their attack. They also placed plastic plants with another set of corals to find the effects of shading and mechanical damage. Within 10 days, they observed that seaweeds had managed to bleach some of the corals. The researchers found that most of the seaweed species had released hydrophobic allelochemicals (chemicals present on the surface of algae that repel water) on direct contact with corals. These chemicals decreased photosynthesis, caused bleaching and death of corals in 79 per cent of the 24 interactions assayed. 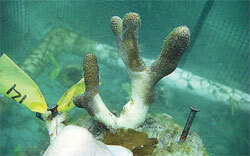 The compounds could be the reason for coral’s inability to recover from the algae-induced damage, says the team. The damage to corals, however, was limited to the sites where they came in contact with the seaweeds. Susceptibility of the corals to the algae also differed. In many reefs, dramatic decline in coral cover occurred with significant increase in fleshy macroalgae. Once established, macroalgae can inhibit coral growth and decrease herbivore grazing and further diminish reef function. The interaction had no effect on the algae. Generally, seaweed growth is controlled by plant-eating fish, but in many parts of the world, overfishing has drastically reduced populations of these consumers. This has allowed the seaweed to dominate. The artificial plants did not affect the corals. The findings have been published in the journal Proceedings of the National Academy of Sciences on October 17. Balasubramanian Thangavel, dean of the Centre of Advanced Study in Marine Biology at Annamalai University in Tamil Nadu, points out another dimension to the coral-seaweed relationship. “Besides macroalgal growth, microalgal blooms are also capable of inducing coral mortality by reducing availability of light to the corals,” he says. However, coral bleaching and death by chemical substances within two to 10 days is exaggerated, he adds.